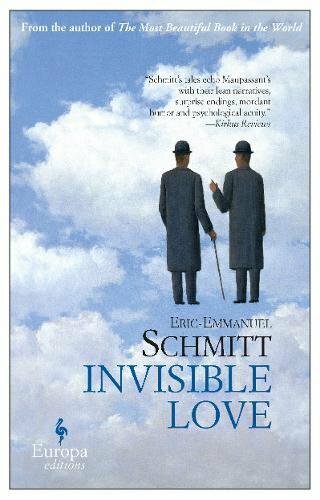 What a delight when a writer hits his target as deftly and with such beauty as Eric-Emmanuel Schmitt does in Invisible Love. His quarry lies in the book’s title. The love he illuminates elegantly and with the lightest touch is “invisible” only because Schmitt approaches his subject obliquely. To illustrate one thing while ostensibly talking about another is a high gift for any writer. No wonder that Schmitt is one of Europe’s most popular authors, awarded the French Academy’s Grand Prix du Théâtre in 2001. Seemingly about external events, each of his four tales reveal at the end the surprising, inapparent love that has steered the protagonists to their various fates. One story conceals another, as it does in the opening tale of “Two Gentlemen From Brussels.” Here a gay couple sits in the back pew of a church and echoes the wedding vows of the bride and groom down front. Over the decades that they follow the straight couple the men become a symbolic part of the couple’s lives and eventually surrogate fathers to the couple’s son who is tragically killed. Schmitt explores both oblique feelings and the paradoxical freedom that often comes from living a life that is either forbidden or scorned. In comparing their homosexual relationship with a heterosexual one, the “Two Gentlemen” gain a deeper understanding of it, its achievements, and frustrations. The four stories all speak to redemption and reconciliation. We fulfill many of our aspirations symbolically, Schmitt claims, and everyone lives two lives—one real, the other imaginary. Invisible Love explores the virtual lives that lie behind real ones. In “The Dog,” we meet an elderly village doctor who owns a series of Beaucerons named Argos after Odysseus’ faithful dog. When Argos is killed by a truck the beloved doctor kills himself, and the entire town speculates why. The doctor’s daughter mysteriously appears at a neighbor’s house, complaining that her father loved his dogs more than her mother or herself. A remote acquaintance shows up practically begging to put on an elaborate funeral celebration. The events explaining these seemingly disparate connections are made clear at the end.